Another Reason We Do Walk Unders! In case you still wonder why walk unders are important, yesterday brought another valuable reason. Walk unders are basically the PMCA’s recommended daily action that a purple martin landlord should take. Walking under and around your purple martin housing can spot problems and issues just not visible from the comfort of your favorite watching spot like your lawn chair. We know that things like wing entrapment can be spotted and birds saved…like we spoke of in THIS blog post. But yesterday brought a blown off gourd cap to our attention. Last year we received a report of a Plastic gourd cap not staying on. Then I had the problem arise myself after adding Coroplast Gourd Cap Liners to my gourds. First, coroplast liners are great, don’t get me wrong. They eliminate light that can filter in a gourd from gourd access caps. But the thickness of the liners can make the caps not screw on tightly. How do you know when the cap isn’t on tight? When you tighten the cap it will get to a point then when you tighten it a bit more it becomes instantly loose. Like the cap hopping the threading on the gourd and the cap can then pop right off. I have tried tightening the caps right up to that “to tight” point and have found that it just doesn’t work. The cap will pop off and usually it will do it at the worst possible time. A few days ago, a line of fierce thunderstorms blew through the area. 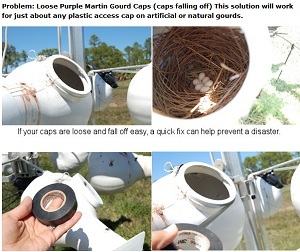 I had done nest checks two days before and noticed this loose cap on a plastic gourd with a ASY pair of purple martins. 6 eggs lay inside and I wanted to raise the gourd rack back up so the birds could return to incubate, so I left the repairs for another day. I had a feeling it would be a problem and made a mental note to fix it at the next nest check. Unfortunately problems never wait. When I came home some 4 hours after the storm I did a walk under and saw that the cap which faces away from the house was gone. The cap was tucked under a line of bushes many yards away. I lowered the housing and did a quick easy fix with electrical tape and noticed the eggs were warm! Apparently mailmen aren’t the only ones that will persevere. Not snow nor rain nor heat nor gloom of night…how does it go? Well, long story short she had hunkered down on those eggs and kept then safe and dry and warm. Now hopefully they will still all hatch. Read how to fix your loose gourd caps here. Any quick fix tips for other issues on your purple martin housing? Feel free to share them here with us! I was poking around Twitter last night and came upon a tweet from someone saying that their purple martins had returned and were again starting to build a nest under their eave of the persons home. I had to chuckle since I knew it was no Purple Martin. As many serious birders will tell you, one of the most important facts in properly identifying a bird is knowing the birds range, behavior and habitat. This person makes a perfect example. Knowing that purple martins do not nest on house eaves makes it easy to correctly I.D this bird as a Barn Swallow. Commonly mistaken by the novice birder, many of the swallow species like Purple Martins, Tree swallows, Barn Swallows can be confusing to some. Add in there Rough Wing Swallows and Violet-Green Swallows and even Bank Swallows, even the experience birders will have to look closely and carefully to distinguish these birds from one another.Heck, I wouldn’t have been able to tell a Rough Wing Swallow from a SY Purple Martin before reading up on it myself. 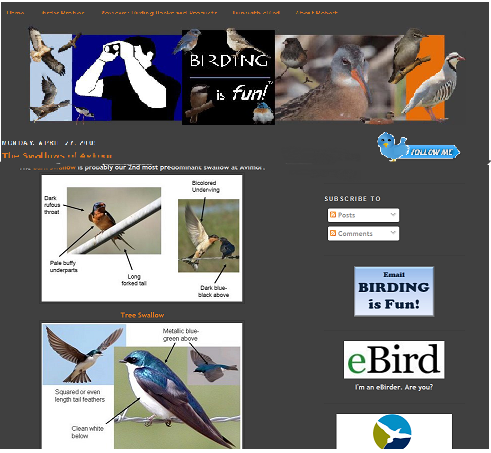 I found a great little site with some great photo comparisons of these commonly mistaken birds at BirdingIsFun.com which has some great tips to help you quickly tell these apart. As for the person tweeting about the purple martins mud nest under the eave of their home, I don’t think they care. But still it makes me think of how many people are out there convinced they are helping martins who may not be? Every year I hear from well meaning people that place housing and tell me about the bright yellow bills of their purple martins or how their martins will not allow other martins to nest in the house. Inevitably I find out that starlings nesting or Tree Swallows are dominating the house. Not to compare a Starling factory with a pair of Tree Swallows, but both examples show how purple martins can be pushed aside. I recommend our Purple Martin vs Starling ID page to help those that are new to the world of birding. 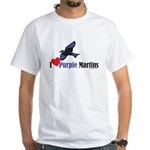 It is a side by side comparison of Purple Martins and Starlings. Even if you are not new, take a look and be sure…If I had a dollar for every time someone swears they have Martins and come to find out they are not! Another great resource we recently added to our parent site was the addition of Daniel C. Drew, M.D. page on Tree Swallow/Purple Martin and Bluebird/Purple Martin INTERFERENCE. With his permission we added this page to our site so that new landlords can be more successful in getting purple martins in their Martin housing and Tree Swallows and Bluebirds in their respective housing as well. Though that page is up again, in its original site we both thought that the information contained within it is vital to new landlords that have lots of tree swallows and bluebirds but no luck in attracting Purple Martins to their properly set up site.